This is Ilina guesting on the Catherine's blog today. Today I am featuring the Rose Garden stamp set along with the coordinating dies to make a hand made thank you card. I love layering stamps and these roses are just wonderful. To make this card I started by stamping the most solid layer using the lightest color. For the roses I used It's a Girl Ink, for the little flowers Tiara and for the leaves I used Melon Ice. Next is the second layer and for this I used Be Mine for the Roses, Tiki Torch for the little Flowers and Lime Rickey for the leaves. Next is the third layer (last layer for the leaves). For the roses for this layer I used Party Dress, Grass Skirt for the leaves and Orange Twist for the little flowers. Last, the darkest layer, that adds so much dimension to the flowers, for the roses I used Rockin' Red and for the little Flowers I used Mandarin Spice. Next I stamped the little flower centers with Tiara ink (all colors are listed on the bottom of this post for easier reference). Once you are done with all the stamping, die cut all the elements using the coordinating dies. Cut a 3 3/4 x 5″ piece of Premium White card stock. Arrange your elements on it, towards the center and adhere with foam adhesive. Stamp the sentiment using Versamark ink on Midnight card stock and emboss using Wow! Opaque white embossing powder. Trim to size. Adhere to your card panel and adhere the panel onto Black note card. Add Black Nuvo Drops as finishing touch. 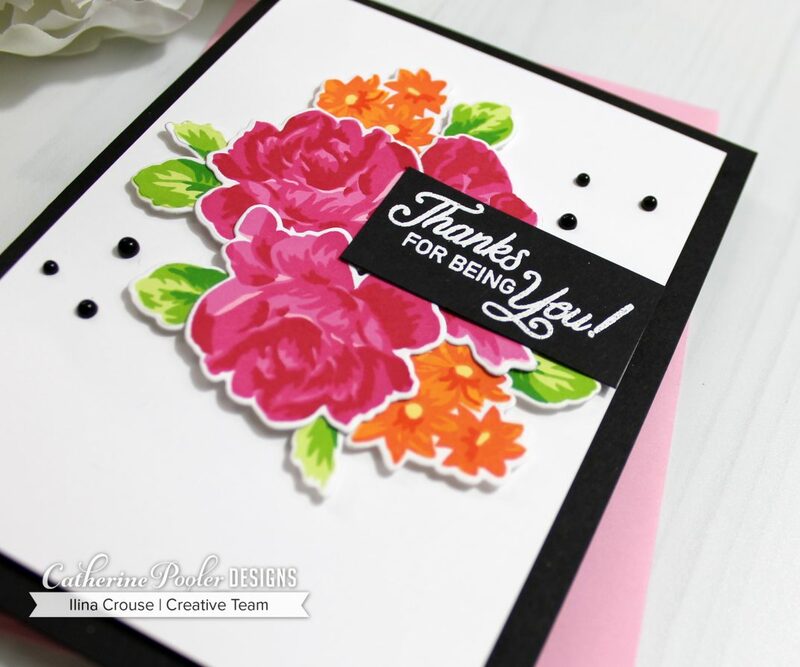 The colors and the layering on these stamped roses are so striking on this black and white background for the card. I hope you are inspired by this Thank You Card! 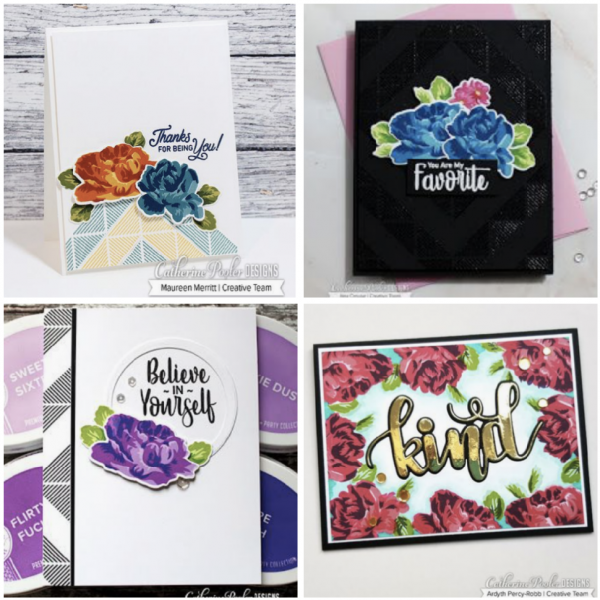 Here are a few more cards made with the Rose Garden Stamp Set. You can see even more and get links to these blog posts by visiting our Pinterest Board.